Things are changing in the world of human resources. The role of human resources is no longer limited to hiring, managing compensation, and ensuring compliance. Since the 1990s, a transformation has occurred. 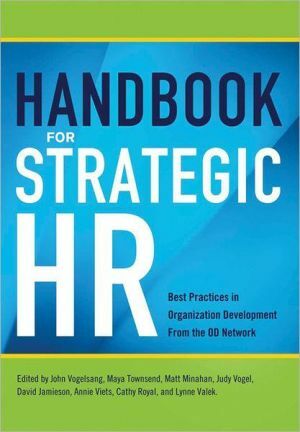 Companies are calling upon a new breed of HR professionals to behave as organization development consultants, helping to determine priorities in running the business, design how work gets done,craft strategy, and shape culture. OD PRACTITIONER is the quarterly journal of the Organization Development Network, an international association whose members are committed to practicing organization development as an applied behavioral science. John Vogelsang, PhD^Maya Townsend^Matt Minahan^David Jamieson^Judy Vogel^Annie Viets^Cathy Royal^Lynne Valek, Eds.